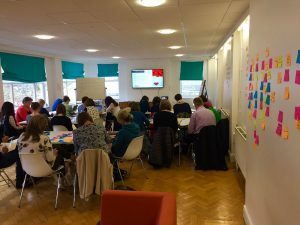 WHELF was very pleased to have Andy Priestner run a UXLibs workshop at the University of Wales Trinity Saint David, Carmarthen campus on 30th June 2017. Many thanks to Nina Whitcombe (Swansea University) and Sue House (University of South Wales) for these excellent blog posts about their experience of the day. “I registered for this course as soon as I saw it advertised on the enthusiastic recommendation of a colleague who had already attended training given by Andy Priestner. The course became full very quickly so I am glad that I did manage to book early. After working in academic libraries for longer than I am prepared to admit, it becomes very easy to fall into the mind-set of assuming you have a good grasp on what users want. This training was a timely reminder that user requirements constantly evolve and in order to meet institutional aims for student experience we need to gather behavioural and attitudinal data alongside the more traditional data such as footfall, number of loans etc. Throughout the day, Andy introduced a variety of ethnographic approaches that can be employed when gathering research data from library users. The results can then be examined to identify how our services and spaces are currently used and how people want to use them. 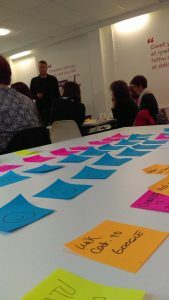 We were given the opportunity to carry out practical examples using the various research methods and encouraged to consider how we could take these ideas away with us and apply them in our own work environments. In this slightly unconventional post I’ve tried to use reflective questions learned on a CILIP Professional Registration Workshop & Mentor Information and Support Session from CSO Sharon Cook to share with you a personal evaluative and critical summary of the day. Why did I do this activity? UX is a holistic approach to giving users not just what they want but also what they ‘don’t yet know they want’ and if it is done well and services and products change for the better as a result of feedback then ‘customer service’ is not necessarily required as the experience of our services and products will be good/great. There are several methods available – surveys/focus groups are ok if very well designed, but there are lots more engaging methods which will illicit more useful and effective data e.g. 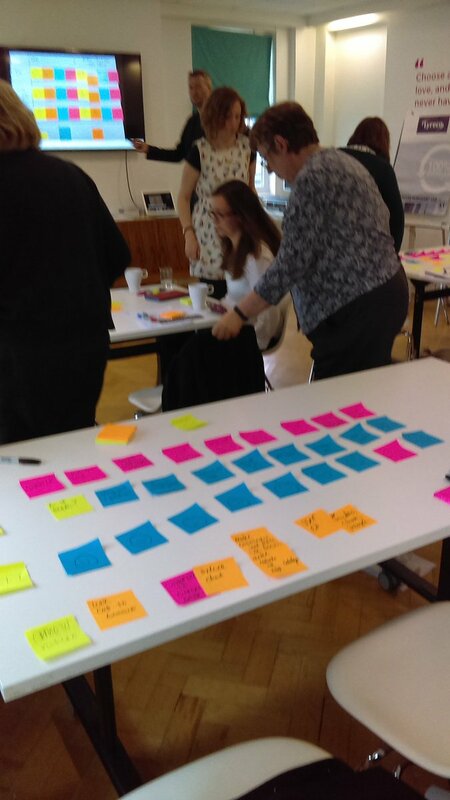 observations, mapping the ‘desire line’ through a space, in-depth user interviews, cognitive mapping, photo elicitation interviews, user journey mapping, card sorting, touchstone tours, love and break-up letters etc. Several of which we were able to experience in various activities throughout the day. You can start small and scale up, you just need post-its and Sharpies! How is this going to change my practice? How am I going to share this new knowledge? How am I going to monitor impact? I will report back on the observations and inductions to my line manager with any suggestions for improvements to library space and services. Ask yourself – ‘So what’? 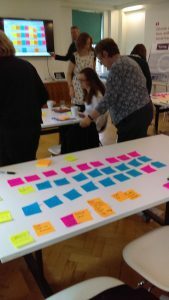 The recent updating and development of classic ethnographic research methods to ‘UX’ has really energised many in the library community to gain a better understanding our users. At a time when libraries are under pressure to provide return on investment/value for money and evidence-based services these methods can relatively easily and more effectively inform the strategic and operational direction of the library service at USW. I would advocate that all USW library staff be involved in UX work. Andy was a great trainer and above all else it was a fun day out – yes, really!